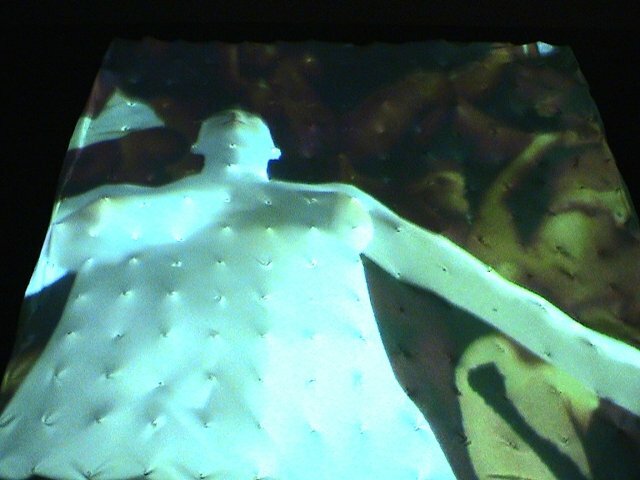 A large matrix of 225 electro-mechanical actuators conform a projection surface to match a 3d image/dataset in real-time. 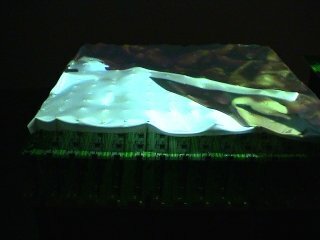 Using only light, the "terrain machine" surface reacts instantly to the light and shadow projected upon it. Viewers can "insert" themselves into the datastream, casting shadows on the input matrix, directly manipulating the surface dimensions, in real-time. Terrain is the result of a 2002 grant that Klima received from The Daniel Langlois Foundation to invent and construct a 'dynamic display surface' for representing virtual 3D imagery and landscapes in three-dimensional, physical space. The culmination of Klima's explorations into "the real world as it exists in data," it is a large projection surface that can instantly contort and deform to shape landscapes based on 3D data sets. 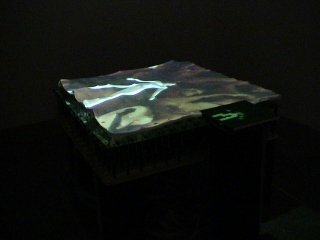 Projected onto this three-dimensional screen is a high resolution dynamic image that corresponds perfectly to the "terra-forming" surface below. The dynamic image is created from the same 3D data set as the projection, but rendered such that the shadows and highlights are direct translations of the three-dimensional contours of the objects being projected. Terrain represents unique angle on the issue of digital representation. Using light -- the analogue representational force behind photography and cinema -- Klima enables a seamless transition from virtual data to physical forms, simultaneously inserting the "human" as the manipulator, and master, of this transformation. For the piece, Klima invented an analogue circuit that is triggered by nothing but light. This allows viewers to 'insert' themselves into the data stream by directly manipulating the surface through movements of their hands. "It's as close as you can get to Keanu Reeves reaching out and stopping the bullets in 'The Matrix.'" A matrix of light sensors receives a data stream from the projector, and the viewer can block and manipulate this flow in real-time, instantly seeing the effect on the physical surface itself. Any image can be projected onto the surface, which will instantaneously conform to the light and shadow of the image.